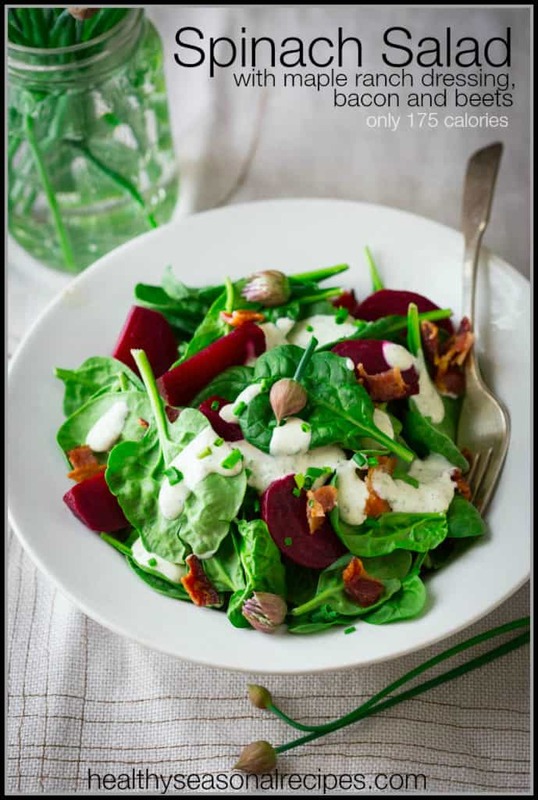 The salad love continues today with a healthy spinach salad recipe with beets and bacon. It is topped with home-made light ranch dressing with maple syrup in it. And it is only 175 calories for a whole delicious bowl-full. After rambling a bit yesterday, I’ll try to keep it quick today. I really wanted to share this dressing all on it’s own today, but I figured now that I’ve shared my tips for what to do with your beet greens, I better give you some new inspiration for your beets too. But this salad idea really did come from the dressing first. See, I only have a few creamy dressings on the blog, and only one ranch. (Which is actually a ranch dip.) So I decided to make a light ranch dressing with a hit of maple syrup in it for a little sweetness. I loved it so much that I used this recipe for the cooking demo I did in my daughter’s classroom. The kiddos loved it too. So, I’m guessing you may fall in love with it too, so when when you make it, you may want to double the batch of dressing so you have some for the next night or for dipping asparagus spears in. In addition to the maple syrup, the dressing also has buttermilk powder to give it that cheesy ranchy flavor that everyone associates with ranch dressing. If you have nutritional yeast and you want to use that instead, go for it. I only used 1 tablespoon of mayonnaise and then a quarter cup of low-fat Greek yogurt. The dressing comes in at only 63 calories per serving. That’s about half the calories of traditional ranch. And it is just as yummy and creamy, if not more so. After deciding on the dressing, the rest of the flavors came together quickly, since beets, bacon and maple go so well together. Yes bacon. You’re welcome:) For meat-eaters, I totally consider it a necessary indulgence. It isn’t exactly health food, but there are four slices for four people. So that means you are only getting about 40 calories from the bacon for each serving. And the flavor and satisfaction from it will keep you out of the cookie jar. The whole salad comes in at only 175 calories. Hey, guys one more thing I wanted to mention. You may like the newly updated free nutritional analysis tool on My Fitness Pal. It is pretty cool. Just plug in the url of the recipe you want to analyze and it does the work for you. You just have to double check that it matched your ingredients correctly. Do you prefer vinaigrette or creamy dressing? Have you ever used buttermilk powder? 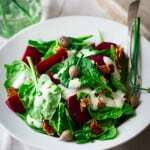 Spinach salad with bacon, and light ranch dressing with beets on top. Gluten-free and grain-free. Make Salad: Place beets in a large sauce pan, cover generously with water. Bring to a boil and simmer until the beets are tender when pierced with a fork, 40 minutes to 1 hour 10 minutes depending on size. Drain and cool. Trim, peel and cut into wedges or slices. Arrange spinach in salad bowls. Top with the beets, bacon and ranch dressing. Garnish with chive blossoms. You’re photos of this salad are so spectacular, Katie! They truly look like I could reach out and take a bite. Your creative salads are inspiring me to get out of my lunch salad rut. Thanks for another great post! Thank you Bill. I have to say I sure am enjoying all of these salads myself. 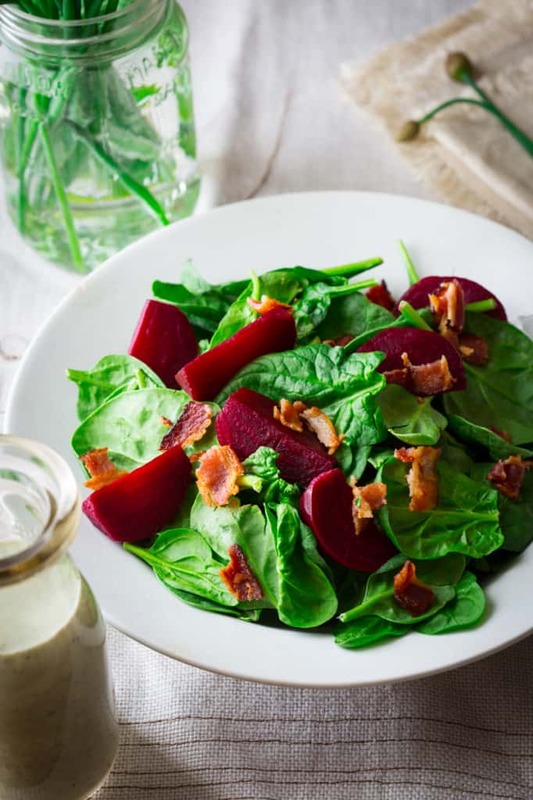 This dressing sounds incredible, and I love the original flavor combination of bacon, and maple, AND beets! Yum! Beautiful photos too, Katie. Thank you so much Marisa. Glad you came by. I’m not a fan of creamy dressings, but this would also work lovely with a poppyseed dressing I bet! I DO love buttermilk powder, best kept kitchen secret I’ve discovered! I go through phases of using a lot of fresh buttermilk, but we haven’t been using it much lately. I agree about liking both creamy dressing and vinaigrette, and it depending on my mood. Love the idea of adding maple to ranch. So unique! I will take two for the lunch! Love that ranch dressing. Such a pretty salad, and now I’m thinking, why have I never bothered to pair beets w/ bacon? Love the idea of the sweet and salty combination. 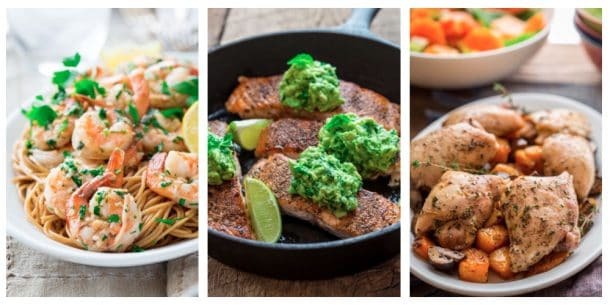 This is definitely a recipe I’ll be making soon! BTW-I pretty much only make vinaigrettes, but my kids do like ranch, so I’ll give your dressing a try too! For the longest time, I didn’t bother doing anything with beets other than pickling them since I loved them so much that way. Now that I have discovered how much my family loves them any which way, I have started trying them with all sorts of combos. I think they go great with smoky or salty things. Hope your kiddos like the ranch. Thank you for visiting E.A. I’ve never used buttermilk powder. I love buttermilk for cooking, though. And I’ll confess… most of the time I lean toward non-creamy dressing, but this would be an exception!! 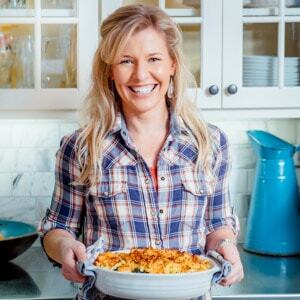 I had never even heard of the buttermilk powder until I was in the EW test kitchen. I love how concentrated the tangy flavor is for a use like this. What an absolutely stunning salad! It’s so beautiful…. I want to face plant right through my screen into that bowl! Loving the sound of the maple ranch dressing… I’ve never seen buttermilk powder before! Ha ha. I love that a salad would elicit that response from you Chris! Salad lovers unite! Thanks so much Christine 🙂 Glad you like this idea.